“With a growing awareness for benefits of outdoor play, it seems everywhere one turns there is talk of children and nature. One particular approach that is receiving a lot of attention is nature-based or forest preschools. While the number of nature-based preschools is increasing, there are more young children needing experiences with nature than these programs can provide. At the same time, many early childhood educators who understand the value of outdoor experiences find themselves in a traditional setting unsure of how to meaningfully integrate nature into their programs. 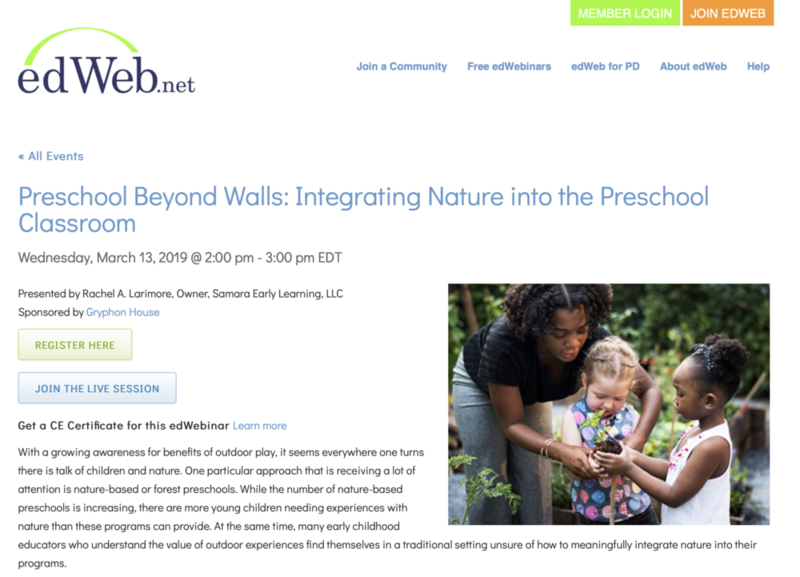 This edWebinar will help early childhood providers, no matter their situation, consider the principles fundamental to a nature-based approach and integrate those principles into teaching practice. These high-quality nature-based early childhood education (NbECE) practices don’t happen overnight, but rather occur through daily programmatic and teaching decisions. Using a continuum of NbECE as the overarching framework, Rachel Larimore will provide concrete ways to better integrate nature into your program structure, physical environment (inside and outside), and teacher-child interactions. To register, visit the edWebinar site.